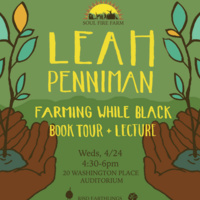 RISD Earthlings, in collaboration with the Division of Liberal Arts and SEI, welcomes food justice activist Leah Penniman, cofounder of Soul Fire Farm, who will speak about her work and her book Farming While Black. Free and open to the public. RSVP here. Book signing will follow talk.